namaḥ (n/V) – adoration, homage; tritatā – thirdness [here m.c. for tri-tathatā ‘three suchnesses’]; vinyāsa – putting down or on placing, distributing, arrangement, order, disposition; śiva – kind, friendly, mild, gracious, lovely, auspicious, fortunate; śakti – (f) ability, power, capacity of; samanvite (f/V) – completely possessed of, fully endowed with, possessing, full of; graha – grasping, seizing; vetāla (m) – demon, ghost, spirit, vampire; yakṣa (n) – semi-devine being, attendant to Viṣṇu; gaṇa (m) – inferior deity, servant of Śiva, troop, crowd, host, tribe, suit, retinue, flock; nāśani – destroying, removing; pravare (f/V) most excellent, chief, principal, best; ture (f/V) – quick, willing, prompt. Homage to you, who is adorned by three Suchnesses. Perfectly endowed with the power of serenity. Destroyer of demons, zombies and yakṣas. O TURE! Sublime excellent lady. The twenty-first praise is the homage to Lhamo Odser Chenma,Tib the “Goddess with Brilliance”, who can restore the life force. She is white, her left hand is in the boon-giving mūdra, and her right hand is in the refuge-giving mūdra, holding a blue lotus on which sit the auspicious golden fishes. At her three places: crown, throat, and heart, are OṂ, ĀḤ, and HŪṂ, respectively, which form the sublime protection against all obstacles. The light rays from these letters protect the three doors of beings from the harm of all outer obstacles caused by evil forces, both form and formless. They also protect beings from the inner obstacles of ill health, and the secret obstacles of dualistic affliction. The rays have the power to pacify them without a trace. Particularly, the rays from the three letters can restore the life force stolen by spirits, zombies, and yakṣas, and eliminate their harmful intentions and actions. 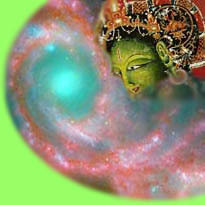 The homage is to TURE, the great compassionate lady who acts swiftly for the benefit of sentient beings. The true meaning is that Tārā has the power to guide the minds of beings to be tamed in the “three approaches to liberation”. These are: emptiness, attributelessness and aspirationlessness, or, the suchness of an entity, its nature and compassion, and the clearing of all its obscurations. Ultimately the vajra body, speech and mind are the primordially pure nature of all phenomena. By meditating on the sphere of the indivisibility of the three vajras, the demons, sufferings, zombies, and yakṣas are transformed by the great bliss of primordial wisdom. mantra – sacred speech or text, prayer, hymn, charm, spell; mūlam – foot, basis, foundation, ground, origin, source, root; idam – this, this here; stotram – praise, hymn; namas-kāra – exclamation of nāmas, worship, adoration; eka-viṃśaka – twenty one.